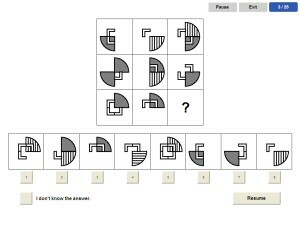 At Adaptive Matrices Test you are shown a matrix of nine squares eight of which contain geometric symbols. Setup and order of symbols is subject to a logical scheme. Symbols may be overlaid in row or column. The product of two symbols overlaid must not necessarily be shown in the last square of a row or column, though. The symbols may be of different geometric kind and pattern.